Times of the Islands – Under the Mistletoe . . . This unusual plant is not as “romantic” as it would seem. “Ugh, it’s like evaporating rubber cement,” I lamented, scraping the mucilaginous liquid off my fingers onto the twig of a pink poui tree, “No wonder I could never get it to work before—I was doing it wrong all these years.” Botanist Marcos Caraballo was teaching me how to plant the sticky seeds of mistletoe—specifically Caribbean smooth mistletoe Dendropemon purpureus. Found only on islands in the Caribbean basin, this species is widespread but only common in small localities, one of those being in the Northwest Point area of Providenciales. These are mistletoe plants from South Caicos, formerly considered endemic to the mountains of Hispaniola. Most people associate mistletoe with winter and Christmas time, hanging sprigs of it, real or artificial, in doorways to instigate the tradition of kissing under it. This tradition dates back so far that its beginnings are lost to history, but there was formerly a tradition that after each kiss, one berry was removed until none were left, at which point the kissing stopped. Tradition also dictates that it is bad luck to refuse a kiss under mistletoe. But mistletoe in the Turks & Caicos Islands? At least three species of this strange group of plants make their homes here, taking advantage not only of the tropical climate and abundant migratory bird seed dispersers, but also of the diversity of host plants. Mistletoes are parasites. They do not grow in the ground as most plants do. They grow on the branches of other trees and shrubs—but unlike the orchids and air plants which are epiphytes (which merely use other trees as a perch and take nothing from them), mistletoes worm their roots through the bark of their host trees and shrubs and help themselves to the liquids they find inside. Absorbing these liquids, most mistletoes use them to help make their own food. Typically, mistletoes have green leaves and chlorophyll, and so photosynthesize to produce sugar. 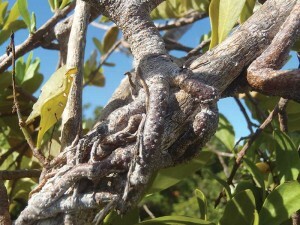 This Caribbean smooth mistletoe is parasitizing a five-fingers plant in North Caicos. All three of our known species in TCI live in this way. There are other species that only make their own food early in life, including a parasite on pine trees in Hispaniola’s mountains and one on cacti in Peruvian deserts which live their lives entirely inside their hosts, only spearing outside to flower and fruit and bearing no leaves or green stems of their own. Some species overtake and can even weaken their host plant to the point of death. The benefit of this to the mistletoe is unknown, since it also dies with the host—but it may be that such heavy infestations on one tree are entirely accidental and not deliberate. Our TCI species may weaken a tree, as is suggested by the generic name of smooth mistletoe—Dendropemon arises from dendro (tree) and pemon (injurious). They are more common among the three to five families of plants (genetic evidence suggests they all evolved separately) that make up the mistletoe group: they do not tend to be injurious enough to kill the host; they just grow as a small, shrubby cluster of rubbery foliage that looks like a misplaced branch of another tree. These small rubbery shrubs can be difficult to spot. Often, they tend to grow toward the centre of their host’s crown and are concealed amongst the host tree’s own leafy branches. For this reason, they are easily overlooked until a drought forces trees to drop their leaves, or until one walks directly into a droopy specimen on a low-hanging branch. That is precisely how I encountered the mahogany mistletoe Phoradendron rubrum in 2001, previously unknown from TCI. Hiking south from the runway in Middle Caicos through a wholly unpleasant habitat of razor-edge eroded limestone interrupted with sinkholes full of sawgrass, red mangrove, and mosquitoes with higher ground dominated by poisonwood and spiny plants, as I ducked under a West Indian mahogany branch, I was brushed in the face by what felt like a plastic ornamental aquarium plant. Not recognising the long, curved leaves, I followed them up to stems that ended in a bulbous base firmly attached to the mahogany tree itself. Since that time, this species has been found in another location in North Caicos, but it is not particularly common anywhere and it only parasitizes West Indian mahogany. A related species, the angled mistletoe Phoradendron trinervium, is recorded from TCI from just two host species (Phoradendron species seem picky) but has not yet been rediscovered since it was catalogued decades ago, and our botanical researchers continue to search for it. Like talons, the roots of the Caribbean smooth mistletoe grip and penetrate its host plant. Far more common and generalist in their tastes are the Dendropemon species. 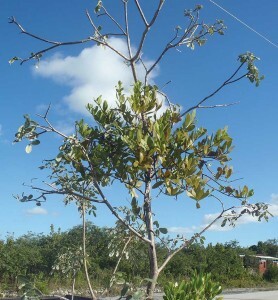 We have at least two, including the common smooth mistletoe, which can be seen in Northwest Point National Park at the end of the sand road among the seven year apple Casasia clusiifolia bushes and among other species of trees along the road, as well as along the North Caicos road to the Middle Caicos causeway. This species has dull blue-black berries most of the year. Another species, yet unconfirmed, is common in small areas of South Caicos, where it parasitizes a variety of low shrubs. 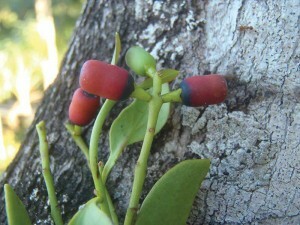 Its distinctive half red, half black barrel-shaped berries have led mistletoe researcher Marcos Caraballo to believe that they may form a disjunct population of Dendropemon elegans, a species otherwise known only from the Dominican Republic. Caraballo explained that the habitats couldn’t be more different though—the Hispaniolan population parasitizes plants in cloud forest, not dry salty scrub. Ongoing research into the genetics should reveal what is happening in this interesting genus. The plants in this genus are small, usually under a foot in height, and their rough stems cam be seen gripping their hosts’ branches where the roots then penetrate the bark. The effect can resemble the claws of a raptor digging deep into a branch. Under the host tree’s bark, specialised root structures called haustoria tap into the tree’s vascular tissue, drawing out water and nutrients. Since our mistletoes make their own food from these resources, they are properly only hemiparasites, but they cannot exist without a host. But how do they get into their host in the first place? The process of mistletoe reproduction is a strange one that requires help from assistants supplied by nature. The berries of mistletoe are brightly coloured (ours are red, black, or yellow) to attract birds. Under that colourful skin, a very thin layer of pulp surrounds a hard, oval seed covered in a white membrane made of a substance called viscin. When birds eat mistletoe berries, they digest the skin and pulp and expose the viscin, which acquires a texture similar to thickening white school glue. The seed sticks to anything it touches, and this causes the bird an embarrassing problem. While birds are usually free to liberally void their hindguts any time they wish, the viscous mistletoe seed just won’t let go. It adheres tenaciously to the bird’s bottom, and the bird must land on a branch, scrape the seed off with wiping motions, and often scoot around the branch or use its foot to break the long, gooey strands of viscin that stretch to keep the seed attached. This way, the seed becomes attached to a tree branch, and the liquid strands of viscin begin to harden and glue the seed fast to the branch. The seed has been planted. If the bird chose the right tree and a living branch, the seed will begin its journey to plant-hood almost immediately. Stimulated by sunlight, one end of the seed begins to open, and a gooey green blob creeps out. Within a day or two, gravity, shadows, and sunlight patterns guide the blob toward the branch to which the seed is glued, and the green blob sticks itself to the tree’s bark like a tiny suction cup. Meanwhile, the first pair of leaves begins to grow from the seed, and the tiny mistletoe plant begins its life as a properly autotrophic being, making its own food from sunlight and stored resources from the seed. Over the next few months, the plantlet absorbs rainwater while its base pushes against the bark of the host tree in search of a weak spot. Eventually, it will penetrate the bark, stabbing into the host plant’s vascular tissue. The plantlet is picky—it needs to be on a branch of a favourable host species, which is protected from drying winds and interfering leaves, but exposed to full sunlight. Without the perfect balance of conditions, it will die, and most seeds never make it to adulthood. Those that do grow slowly, reaching their adult size over several years. Successful wild seedlings are lucky, but mistletoe seeds are notoriously difficult to grow in horticulture as well. We had tried and failed a number of times in the Native Plant Nursery, following outdated instructions not entirely intended for the species we have here. However in December 2014, mistletoe specialist Marcos Caraballo from Penn State University demonstrated the correct way. Keeping the viscin fully intact while extracting the seed from the fruit required a firm but gentle hand, and the fruit had to be opened from the correct end so as not to damage the bud plate. Gently liquefying the viscin with a brief massage to simulate the actions of a bird’s gut, we aggravated the substance into a magnificently sticky mess that stuck the seeds to our fingers. Scraping the seeds onto the branches of a pink poui tree (a tree known to be accepted as a host by numerous mistletoe species) we wound the stretching, rubbery strands of natural glue around the seed and branch, watching it solidify and glue the plant in place. “I feel like Spiderman, shooting web out of my hands, but making a mess of things,” I remarked, only marginally confident that this would work. But work it did, and within a week, the seeds had germinated and most had plugged themselves into the bark. I received another batch of seeds from the unknown South Caicos species, which I followed the same protocol to plant and which also worked well. My pink poui tree may never forgive me; it is now festooned with mistletoe plantlets that are growing slowly but surely as they invade their sacrificial host. I saved a number of the seeds for planting in the National Museum’s Botanical and Cultural Garden on Grand Turk, and excitedly explained to my mother the complicated natural process of how the seeds are planted by birds with the sticky viscin gluing them to branches. As I was on my way out to plant the seeds, she eyed me critically. “You have another way to plant those, right? Because those trees are kind of small and I don’t think they’ll support you . . .” I am happy to report the seeds were planted the scientific way.